Join us in congratulating Eve Marder! 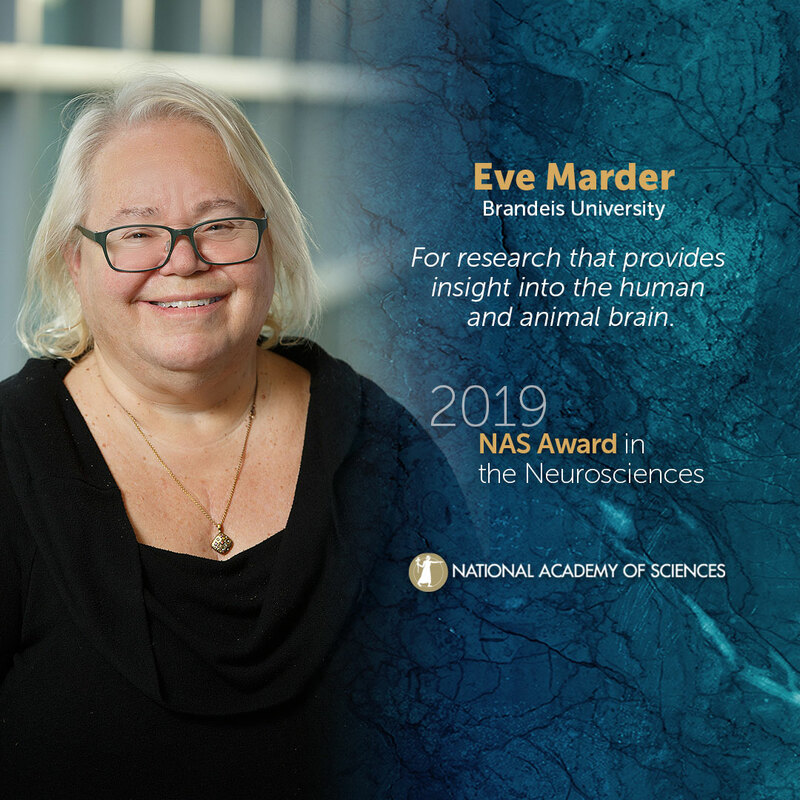 Eve Marder, Brandeis University, will receive the 2019 NAS Award in the Neurosciences. Known as one of the most influential neuroscientists of her generation, Marder’s research over more than 40 years has provided transformative insight into the fundamental processes of animal and human brains. Marder and her research group accomplished this by studying small groups of neurons called ganglia from lobsters and crabs. These ganglia only have about 30 neurons, the activity from which can be easily analyzed and recorded. The research has yielded groundbreaking discoveries about neuronal circuits, including her observations that the neuromodulators within the crustacean stomatogastric ganglion could reconfigure the ganglion activity into new patterns. This set the stage for her later work, which revealed various insights into neural plasticity. In collaboration with L.F. Abbott and others, she developed a new experimental tool called the dynamic clamp which allows complex but realistic manipulations to be performed on living neurons. For the past 15 years, she has been studying individual variability in the underlying processes found in neurons and networks with similar function, and uses natural perturbations such as temperature and acidity to provide insight into individuals of the same species might be differentially affected by climate change. Collectively, Marder’s research has transformed our understanding of microcircuits, revealing them to be flexible and dynamic entities that efficiently balance the needs for plasticity and stability. Marder’s impact on the people in her field is as important as her research. Throughout her career she has served as a mentor to generations of neuroscientists and served the community on numerous other professional levels. She has also served as an important voice for young scientists, as detailed in Charlotte Nassim’s 2018 book, "Lessons from the Lobster: Eve Marder's Work in Neuroscience." The NAS Award in the Neurosciences is awarded every three years to recognize extraordinary contributions to the progress of the neuroscience fields, including neurochemistry, neurophysiology, neuropharmacology, developmental neuroscience, neuroanatomy, and behavioral and clinical neuroscience. The award was established by the Fidia Research Foundation and is presented with a $25,000 prize. Please use the following sample social media posts and other materials to congratulate Eve Marder.